The S40 Gallery app used to try being too many things at once and being a photo gallery wasn’t among its strong points. Now, there’s a separate icon in the main menu – Photos, which serves the one and only purpose of viewing the photos and videos on your phone. The functionality is pretty much the same, but at least the Photo gallery gets rid of the cruft of file managing features and leaves only the image-related stuff in. The Photos app on the Nokia X2 offers only a single viewing mode, displaying a grid of 12 pictures on the screen. You can switch to landscape mode from the menu though – it makes better use of the screen real estate when you open a photo (there are black bars in portrait mode). Zooming in on a single picture is pretty comfortable with the zoom in and out shortcuts placed on the middle and right soft keys. It’s also fast and relatively smooth, even for 5MP images. The music player of the Nokia X2 has decent looks and a solid set of features. It has great all-round functionality, including album art, and a fair number of formats are supported. The music player is controlled either via the dedicated touch keys or the D-pad. Songs can be filtered by artist, album and genre. The player handles AAC, AAC+, eAAC+, MP3, WMA, AMR-NB. Naturally the A2DP profile is supported, allowing the use of stereo Bluetooth earphones. As usual, the artist and title of the currently playing song are shown on the homescreen. They appear in the Radio and music area on the homescreen so they need to be enabled in the Homescreen mode settings for the info to be displayed. The music player has an equalizer with presets and two customizable settings along with Stereo widening. Of course, the Nokia X2 has another feature to enhance its music performance besides the dedicated keys – the stereo speakers. They are set wide apart and are quite loud – no portable speakers needed with the X2. An alternative to the preloaded content on X2 is the FM radio. It matches the music player interface and covers all basic functions. The great thing here is that it has a very sensitive built-in antenna – no need to plug in the headphones for the radio to work. RDS support is available and you can make the handset search and save all available stations in your area. RDS info and frequency appear on the homescreen, much like with the music player. Unlike music playback, video is not the Nokia X2’s strong suit – the small, low-res, 4:3 screen rules out regular use as a dedicated video player. It’s not uncommon for feature phones to include DivX/XviD support, but the X2 supports only MP4 and 3GP. Those are good enough for casual viewing, we guess. Videos can be played in fullscreen mode, fast-forwarded or rewound and that’s that. There are reports of the X2 hanging during video playback – we couldn’t replicate it, but judging by the number of complaints it’s a relatively common problem. Nokia’s R&D department is working on the problem, which is reportedly related to some memory cards. Nokia X2 is one of the quieter phones we have recorded in our audio quality test. However it makes up for that with rather clean output both with and without headphones attached. 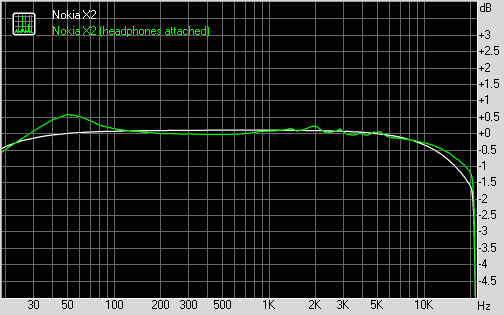 The frequency response is great on both occasions perfect and so are the noise level and the dynamic range. Distortions are well kept under control and despite the stereo crosstalk increasing when headphones come into play, it still remains perfectly tolerable. Here go the results so you can compare it to some of the other handsets we have tested.